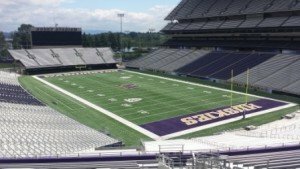 Our own RF Solutions Team got a chance to paint Husky Stadium with an enhanced signal capacity on a temporary installation for one of our valued clients. Legacy is proud to be chosen as a trusted vendor that can enter the serene looking stadium where the Dawgs play. The 70,138 seat iconic Stadium has a view of Lake Washington, the Cascade and Olympic Mountains. Now you can send a text or image to someone who lives in Cougar country and they might just receive it on a Legacy maintained system too!